This Central American street-food favourite is great for parties . 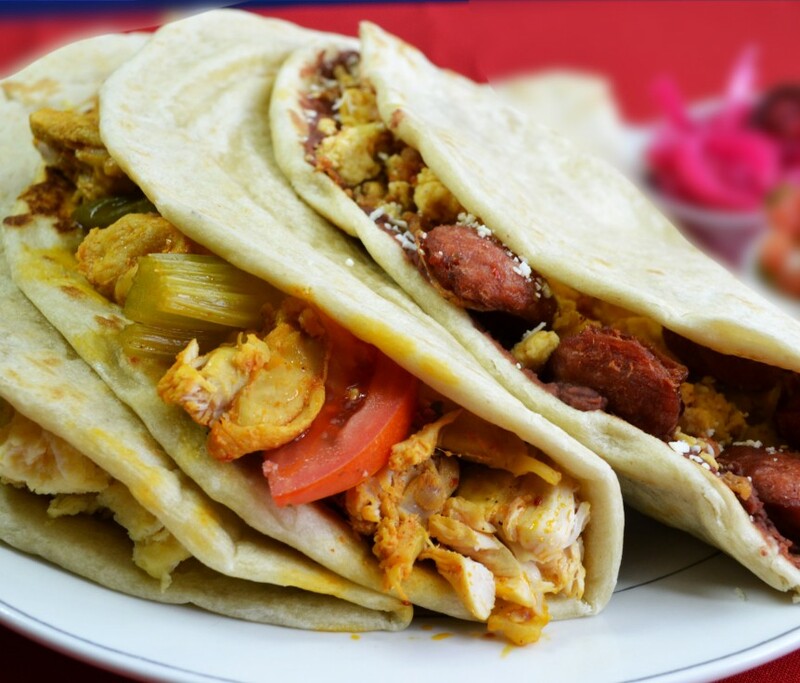 Baleadas are one of Honduras's most popular dishes and make brilliant party food. Just top the tortillas with your favourites – refried beans, fried eggs, chorizo, cheese, avocado… whatever you like! Sift the flour, baking powder and 2 teaspoons of salt together in a bowl and make a well in the centre. Pour in the groundnut oil and about 200ml of warm water, or as much as you need to form a dough, mixing with a knife until it comes together. Tip the dough onto a floured work surface and knead for 4–5 minutes, until smooth and elastic, then return it to the bowl, cover with a tea towel and leave to prove for 1 hour. Place a large non-stick frying pan over a low–medium heat and pour in a glug of the oil. Add the garlic, onions and cumin and sauté for about 10 minutes, until soft and sticky. Turn up the heat to medium, stir in the kidney beans, sour cream and vinegar, season well and simmer for about 5 minutes, until the beans have softened. Mash your refried beans for a coarse texture, or blitz them in a blender if you prefer them smooth. Return the beans to the pan and leave to one side for reheating later. When your dough has risen, divide it into 12 even pieces and roll them into balls. Flatten out each one with your hand, then, on a floured surface, roll them out into a tortilla 2mm thick and about 18cm in diameter. Place a large non-stick frying pan over a medium heat and, once hot, dry-fry each tortilla for 1 minute on each side, until just coloured – you want them to stay soft enough to roll. Cover with warm tortillas with kitchen foil while you fry the rest. When you're ready to serve, lay out your chosen toppings. Place the pan of bean mixture over a low–medium heat for 1–2 minutes, until warmed through, then spread a couple of spoonfuls over each tortilla. Scatter over the chilli and coriander, add your toppings and serve with lime wedges on the side, for squeezing over.